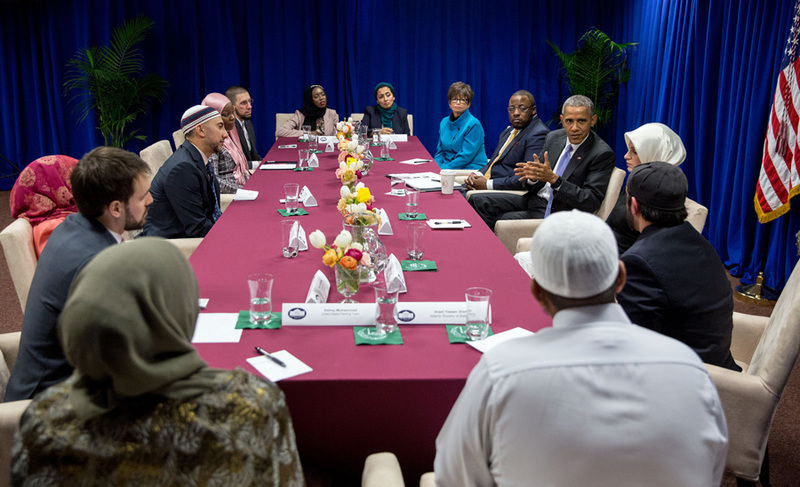 “Right now, many Muslim Americans are worried because threats and harassment against their community are on the rise,” President Obama recently wrote in a commentary for Religion News Service. “We’ve seen Muslim Americans assaulted, children bullied and mosques vandalized, and we’ve heard shameful political rhetoric against Muslim Americans that has no place in our country.” The president’s words recognize higher levels of anti-Muslim rhetoric and violence in America, the intensification of an Islamophobia that spiked after 9/11. What is going on? On one hand, American society is conflating Islam with the group that calls itself the Islamic State and reacting to Muslims in a way reminiscent of its 1940s internment of ethnic Japanese. On the other hand, there is concern that acts of radical Islamic fundamentalists present a threat to the nation. A non-exhaustive list of such events might start in 2009, when 13 people were killed and 30 were wounded by a lone gunman at Fort Hood, Texas. In May 2010, a car bomb was poised to go off in New York’s Times Square. Recently, two shooters killed 14 people in San Bernardino, Calif. — the latest tragedy among a number far too large. There is fair and growing angst within American society about the behavior and treatment of Muslims. But the greater concern should be the emergence of a vicious cycle arcing from fear, to grievance, to violence. Are we already spiraling? While the 9/11 hijackers were foreign nationals, those behind more recent attacks are often American-born or naturalized citizens. Many grew up in this country and even earned college degrees by virtue of their U.S. citizenship. To prevent similar events in the future, we may be inclined to ask of past perpetrators: “Were you motivated entirely by religious radicalization, or was your anger sparked by mistreatment and disenfranchisement?” Whatever the answer, the required response will involve the Muslim community, a part of which has shown little inclination to address the problem of the radicalized within it. We’re seeing now that events like those since 2009 make victims of survivors as well as the deceased. Muslim communities in North America and around the globe mourn alongside the bereaved, but with their grief there is also the fear that all who practice Islam will come to be perceived as terrorists. The natural reaction is to turn inward, and as current events show, it is reasonable for Muslims to be fearful. But it is also reasonable to believe that homegrown terrorist attacks can be prevented, and if we are learning anything, it’s that the best opportunity — and the responsibility — to do so begins at home — first with immediate family members and then friends, co-workers, community members and religious leaders. It ends with law enforcement authorities. What can Muslims do to break the cycle of violence and Islamophobia? Work within Muslim communities to identify extremism and radicalization before it culminates in violence. Uniting a community under a common goal can turn strangers into friends and make the communities warmer, more vigilant and safer for everyone. Neighborhood and community watches do this already and are organized for the same purposes — safety and crime prevention. A well-run program can achieve greater socialization, spot early signs of concern and effectively prevent crime without abandoning personal privacy. American society is made stronger and more resilient when it is a community of overlapping communities and when responsibilities are shared. “You are not Muslim or American. You are Muslim and American,” Obama said in his RNS commentary, echoing a recent speech at a Maryland mosque. It is as much a statement of fact as it is a challenge, and in both cases, it begins at home. Note: Author Athar Javaid is President of INDUS — Mobilizing People’s Power, a Washington, D.C.-registered 501(c)3 tax-exempt think tank and advocacy group dedicated to a progressive and politically stable Pakistan, strong U.S.-Pakistan relations and community integration and civic promotion in the United States. INDUS has no political affiliations in the United States or political ambitions in Pakistan. An example of what Athar Javaid is suggesting is a recent case in Fremont California. 22-year-old Adam Shafi's father reported to US authorities that his son might be influenced by radicals and may be headed to join them in the Middle East. After his disappearance in Cairo, Shafi’s father and another relative contacted the U.S. Embassy, and the relative relayed a text message in which Shafi said he had gone to “protect Muslims,” Monika said. He said Shafi’s father was concerned that his son may have been following “some extreme imams online,” in the agent’s words. Are terrorists more of a threat than slippery bathtubs? President Obama, er, slipped into hot water when The Atlantic reportedthat he frequently suggests to his staff that fear of terrorism is overblown, with Americans more likely to die from falls in tubs than from attacks by terrorists. The timing was awkward, coming right before the Brussels bombings, but Obama is roughly right on his facts: 464 people drowned in America in tubs, sometimes after falls, in 2013, while 17 were killed here by terrorists in 2014 (the most recent years for which I could get figures). Of course, that’s not an argument for relaxing vigilance, for at some point terrorists will graduate from explosives to nuclear, chemical or biological weapons that could be far more devastating than even 9/11. But it is an argument for addressing global challenges a little more rationally. The basic problem is this: The human brain evolved so that we systematically misjudge risks and how to respond to them. Our visceral fear of terrorism has repeatedly led us to adopt policies that are expensive and counterproductive, such as the invasion of Iraq. We have ramped up the intelligence community so much that there are now seven times as many Americans with security clearances (4.5 million) as live in Washington, D.C. Meanwhile, Donald Trump responded to the Brussels attacks with crowd-pleasing calls for torture or barring Muslims that even Republican security experts agree are preposterous. On the same day as the attacks, a paper by James E. Hansen and other climate experts was released arguing that carbon emissions are transforming our world far more quickly than expected, in ways that may inundate coastal cities and cause storms more horrendous than any in modern history. The response? A yawn. To put it another way, this year’s election choices may shape coastlines 10,000 years from now. Donald Trump and Ted Cruz have both mocked the idea of human-caused climate change, with Trump suggesting that it is a hoax invented by China to harm the American economy (he now says that last point was a joke). The upshot is that Brussels survived this week’s terrorist attacks, but it may not survive climate change (much of the city is less than 100 feet above sea level). Doesn’t it seem prudent to invest in efforts to avert not only shoe bombers but also the drowning of the world’s low-lying countries?